"Processed cheese has several... advantages over unprocessed cheese, including extended shelf-life, resistance to separation when cooked, and uniformity of product. Its production also enjoys significant economic advantages over traditional cheese making processes, most often through the ability to incorporate any of a wide variety of less expensive ingredients. "The use of emulsifiers in processed cheese results in cheese that melts smoothly when cooked... The emulsifiers, typically sodium phosphate, potassium phosphate, tartrate, or citrate, reduce the tendency for tiny fat globules in the cheese to coalesce and pool on the surface of the molten cheese," per Wikipedia. Last far longer on the market shelf. OK, so what? What's the big deal? Pasteurized prepared food products are fake foods, according to Pediatrician David Ludwig of Children's Hospital Boston. Highly processed fake foods, always quite low in fiber and ultra-high in sodium (i.e. salt), contribute to the growing U.S. trend of type 2 diabetes, high cholesterol and other health problems. 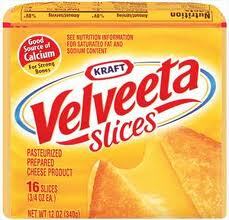 Sure, Kraft Velveeta Slices are handy, time-saving conveniences. But does its rubbery blandness really taste more delicious than hearty, rich cheddar cheese? Is its gluey-smooth texture really more satisfying than the real deal? At $4.99 a package, is it really cheaper than the authentic alternative? Our "all-American" cheese! How disgusting! The term may have passed by now, but years ago the industry referred to processed cheese as "ribbon products" because they resemble miles of ribbon while being extruded from the equipment. They are then packaged on plastic sheets and wrapped in plastic for convenience which a growing number of informed consumers now regard as carcinogenic. Incidentally, those grated and shredded cheeses we get already prepared may be natural products but for convenience are dusted with something to keep them looking fresh and not clumping together in the packages. I think it's talc or something similar, but at our house we use actual knives and hand graters for cheese. And although they are expensive Parmesan, Romano and the other grated cheeses have a much better taste when grated fresh. Olya, I completely agree: "American" cheese is disgusting. John, thanks so much for the encouragement and good words! I have always despised the taste and texture of this fake cheese. When I see it used in baked macaroni and cheese recipes, it makes my stomach turn. It's revolting stuff, and thank you for explaining why. I came here because I'm convinced that in the UK they are making fake Mature Cheddar! If you pay less than a certain price for mature cheddar, it's very likely to have a weird chemical taste, a strange texture or face cheese crystals in it that are far too crunchy to be real! Sine maturity in cheese is a consequence of ageing it over a period of time, and they aren't doing that (if they were, there would be no need for fakery) they definitely shouldn't be allowed to call it mature.